Be there for some of downtown’s signature events. While there are dozens of great events happening downtown every day, there are also some big, not-to-be-missed events that we look forward to every year. 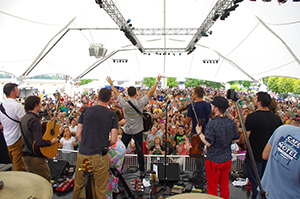 Downtown Dayton is home to many of the region’s best cultural and music festivals, fun celebrations, and other large-scale events that draw crowds from all over and showcase all that our city has to offer. From seasonal events like the Summer in the City lineup and the Dayton Holiday Festival to cultural celebrations, live music festivals and more, you won’t want to miss these perennial favorites. Find out why downtown Dayton is the region’s hottest, most in-demand address during our free Downtown Housing Tour, the first signature event of the 2019 DP&L Summer in the City lineup! Check out a variety of homes, from condos and townhomes to apartments and chic urban lofts, and even get a sneak peek in some projects still under construction! Experience the fun and convenience of downtown living, with restaurants, brewpubs, shops, performing arts, galleries and more just steps away. HELP PUT ON SOME OF DOWNTOWN’S SIGNATURE EVENTS! The Downtown Dayton Partnership is frequently in search of great volunteers to help us put on fun events like the Dayton Holiday Festival, Art in the City, and more. We also occasionally help recruit volunteers for big downtown festivals and events put on by other organizations. Want to help? Click the button to learn more about volunteering.